The online Key Bank job application is available via the company’s careers page. Follow the links posted on this page (near the top of the page/in the instructional guide) to go to the company’s employment page. When you open the company’s employment portal you will be able to search for current job openings, register for an online account, and fill out/submit applications for any job openings that you want to apply for. 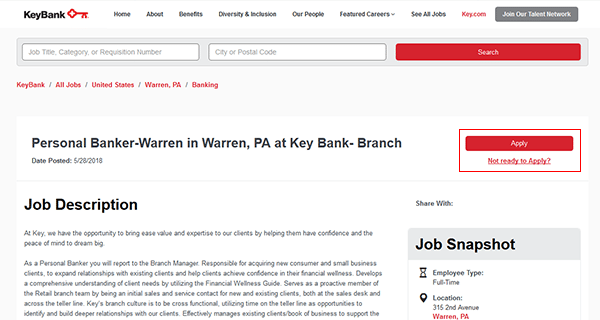 About the Company: Key Bank is an American bank based out of Cleveland, Ohio. The bank has more than 1,000 locations across numerous states throughout the country. Read the guide posted below to learn more about the company’s online application/job search processes. Key Bank was founded in 1825. Step 1 – Copy and paste the following URL/link into a new tab or window in the web browser that you’re currently using. Open the link. Note: If you want to go directly to the Key Bank jobs page simply scroll up this page and press the blue button. Step 2 – Once you have the careers page loaded, enter a keyword into the first input field and a location into the second. Click the search button to load the list of results/job openings. 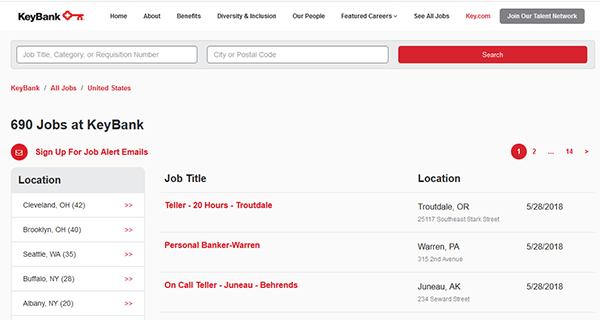 Step 3 – Use the filters on the left side of the page to sort through the list of openings. Click the job title link of the specific job that you’re interested in to learn more about its requirements and responsibilities. Step 4 – Click the button as outlined in red in the below screenshot to go to the next step of the process. Step 5 – Sign in to your account. If you need to create one, click the “Don’t have an account yet?” link. Step 6 – Create an account and then fill out/submit the Key Bank job application form.